The kitchen is one of the most important rooms in the house and needs to be designed by those who pay particular attention to detail! This is where family members and friends spend afternoons or evenings together, where food is cooked and where the refrigerator is searched for a delicious treat! This is why it's so important for many people to realize a unique and impressive style when it comes to the decor of the kitchen. What is especially popular at the moment is a retro design, which greets the inhabitants of a house with an incomparable freshness, inviting a wonderful start to the day. Anyone who visits a home that features a retro kitchen will also find joy and energy in this space too. You can get creative with the wallpaper, add bright colours and enhance the space with comfortable benches. There are so many details and fun to be add designing a retro kitchen, evoking consistent enthusiasm among residents and visitors. This is why today at homify, we have compiled the most beautiful ideas for you for you kitchen, displaying retro styles from top professionals from around the world. You will be inspired to transform your own kitchen! What is highly popular with cuisine lovers are vintage kitchen appliances, which add pastel shades and a special flair to the kitchen space. A retro toaster combined with a matching lunch box, aesthetic enamel jars for biscuits, sugar of flour or colourful cooking pots and coffee cups can all bring a wonderful touch of retro style to a kitchen. In fact with a few small details, you can succeed in giving that very popular vintage look and feel to this interior space. What's great bout this design is that you can combine different stylistic elements from the past decades, bringing in elements from the 20s and 30s or 60s and 70s. By combining them skillfully, you can set up your retro kitchen in no time. In this image, we can see how the pots and pans hanging on the wall as well as the kitchen tools will catch the eye of anyone! The checkerboard pattern is a classic when it comes to popular retro designs. To date, the combination of black and white tiles is one of the most popular design options, especially for a kitchen. 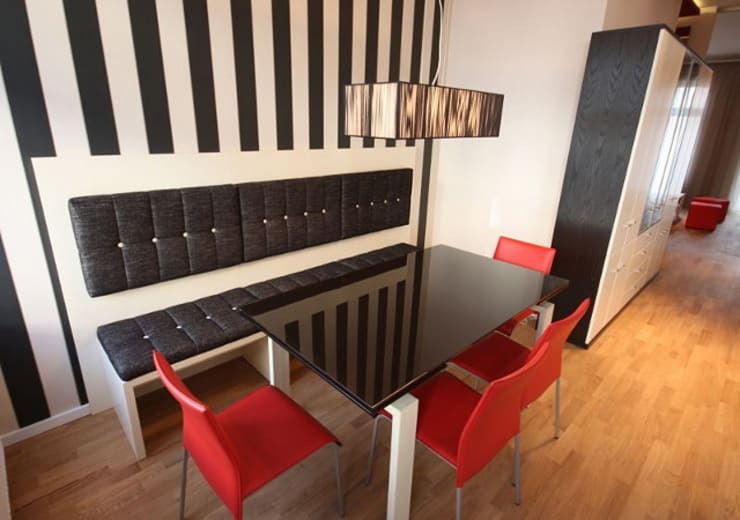 Black and white patterns are a popular style element that can also be integrated into other rooms in the house. In this design by Lichters Living, we can see how the tiling contributes to a very unique design. 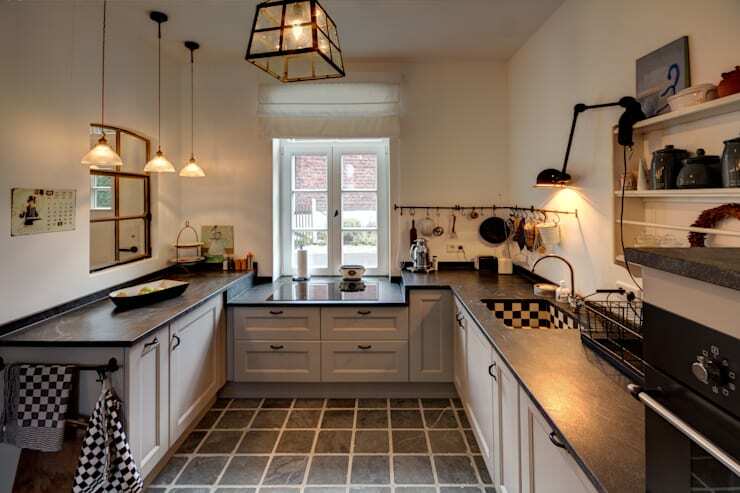 The furniture in this kitchen is decorated in a country-style, with some retro elements. What really stands out is the beautiful wash basin, which adds a subtle splash of the retro theme. Overall, the theme doesn't overwhelm the space, but there is a wonderful emphasis placed on nostalgia. This trend follows the same theme that we spoke about earlier, but the floors and the walls have been done in a retro style, taking on the popular checkerboard design. 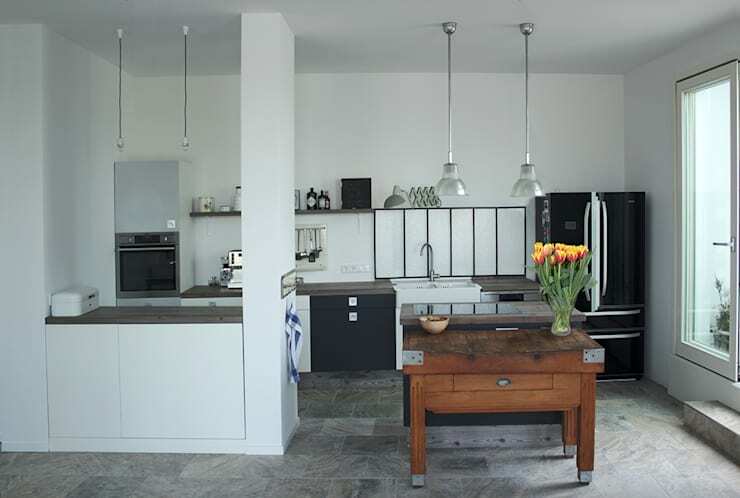 This bold and emphatic design works in a kitchen space, making for a very impressive retro room. What this design shows is that if you want to work a retro look and feel into your kitchen, you don't necessarily have to do it with so many different accessories or vintage appliances and pastel shades. Instead, you can go for a single, eye-catching style element that is simply retro chic. 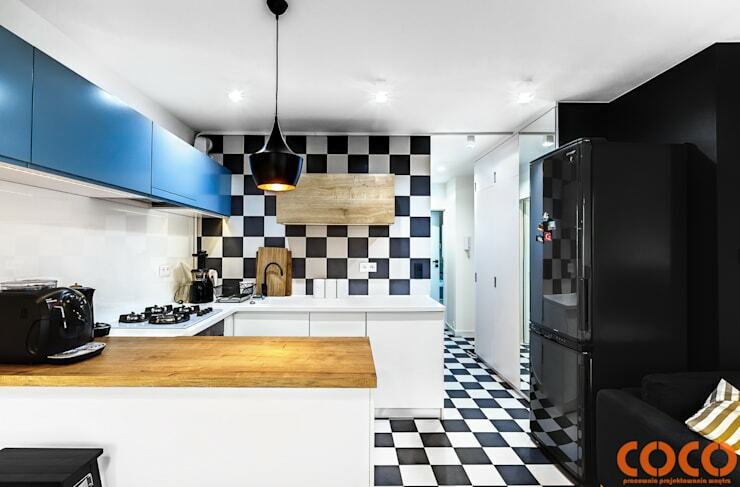 The checkerboard pattern is indeed a classic retro style and is the best choice as well as the easiest way to provide an extraordinary flair to the domestic kitchen. As you can see in the kitchen, it is very eye-catching in an otherwise simple kitchen. Have a look at these 10 fabulous black and white kitchens for inspiration. Lamps are an important element in the establishment of a kitchen and if you decide to go for a retro style, the stylish lamps chosen can bring a vintage touch to the space while doubling up as a functional element. Look at the lamps that have been installed in the image above. These alone give the kitchen that sense of nostalgia. What is also striking is how the lamps invite the retro chic look and feel into the kitchen and the dining area. The combination of rustic wood and black and white elements is smart, modern and slightly eccentric. Here we can see not just the retro elements but how there is an interaction of all styles in the kitchen, which play an important role. There is also a hint of futuristic design, creating a stunning kitchen look and feel! The walls are a great way to introduce a retro design into any room. If you can find wallpaper that ignites your interior design with beautiful patterns and bold colours, even better! In fact, by using matching wallpaper in the kitchen and dining area, you can really create a classic looking home. 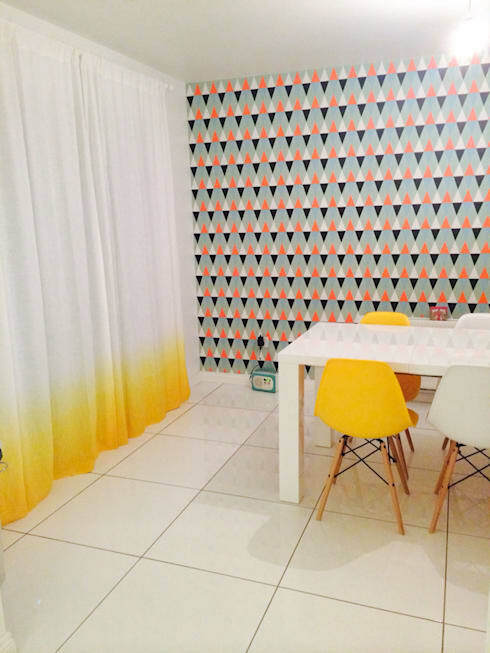 This wallpaper needs to feature striking colour combinations and simple but impressive patterns in geometric shapes. The wallpaper from the 70's is a great example that yourself, your children and especially your parents will take delight in. These will be abstract, surrealistic and colourful, resulting in the wildest combinations that will give your kitchen that retro feeling. As we can see in this image, but using wallpaper in a dining area and kitchen space, you can really create a gorgeous design. While the wall is the wow factor, it is complemented by bright yellow chairs and a very interesting curtain. This is a brilliant example of symbiosis between retro chic and contemporary styles. We recommend that you keep your eyes peeled for wallpaper in a retro style when it comes to transforming your dream kitchen. It's mandatory to have comfortable seats in your retro kitchen because not only with the design provide comfort, but it will allow this space to be used by friends, family and visitors. While there are so many options that you can go for, the very classic example is the wood kitchen bench with the upholstered cushioning. In the image, we can see how the seating creates a cozy center in the room which is quite classical. The wall and the red chairs provide a bit of contrast to the black tones, which makes for a very inviting and homely kitchen space. As you can see, there are numerous ways to incorporate retro chic into your home. No matter what your budget is and what style speaks to you, you can turn your kitchen into your own personal retro paradise. From furniture to wallpaper, from lamps to kitchen appliances – look around and find your own personal nostalgic kitchen style. Also have a look at these 6 tips to retro style your home! 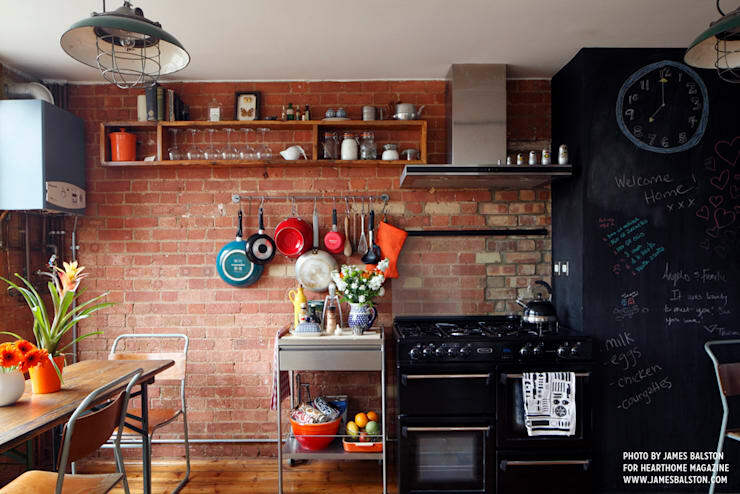 Would you go for a retro style in your kitchen?